After tackling the Russian Front with the first game of the No Retreat! Series, wargamer and designer Carl Paradis revisits this fascinating campaign with: Absolute War! -The Attack on Russia 1941-44. This two-player wargame recreates the titanic struggle between the invading armies of Nazi Germany versus the Soviet Union in afresh new way. This new approach is even faster and easier to play - making it perfect for introducing new gamers to the hobby. The design emphasis has been placed on making the gamevery player-friendly and manageable in its level of scope, difficulty and time of play. With a very low total counter count and density, this quick playing (while still realistic) simulation presents players with deep strategy meriting contemplation. A system of map areas has been adopted and movement has been streamlined. Combat is handled by the two decks of cards (one German and one Soviet) - meaning no combat tables or dice to roll. These cards are the crux of the game system offering even more variety than regular Combat Result Tables. Like in “No Retreat!” they are used to generate events and special game abilities (ex: Major Offensives, Partisan Raids, Siege Artillery, Increased Replacements, etc…) and now also effortlessly resolve all battle outcomes. The set-up for a campaign or a scenario will be lightning fast: in less than 10-15 minutes you can get the game going! This high degree of re-playability means that it will reward players' experience with increased skill. “Absolute War!” will put emphasis on strategic planning - not tedious hex maneuvering or factor-counting to attain the “perfect” attack. Most of the time-consuming calculations will be taken care of effortlessly by the game engine, letting you concentrate instead on exercising your generalship skills against your opponent. Area-movement will provide the proper feel of sweeping maneuvers, exploitation and encirclements across the vast steppes and forests of Russia. The grueling city sieges will be represented by allowing local battles to unfold, with sometimes both foes occupying and battling in the same critical map areas. 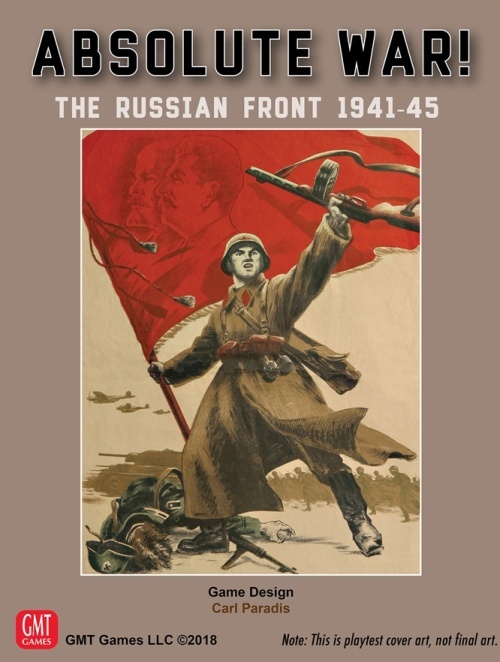 With a simple – yet effective - economic model, players will also feel the growing might and sophistication of the Soviet Red Army and the degradation of the once-invincible German Wehrmacht over the epic four years that this merciless campaign was fought on the soil of “Mother Russia”. Victory conditions are simple and to the point: you have to capture as many of the ten map objectives to force a campaign decision. While destroying the foe’s armies will also help in this endeavor, some event cards will also provide short-term goals to accomplish - gaining players’ special game advantages if met. Neither side can afford to show mercy to their hated foe in this life-or-death conflict, you are in command in the largest and most grueling campaign the world has ever seen. War is hell, and this is Absolute War! Barbarossa, 1941 : The initial assault on the Soviet Union. Can the Germans take Leningrad and Moscow before “General Winter” freezes the German war machine dead in its tracks? Fall Blau & Operation Saturn, 1942 : The Offensive towards the Caucasus Oil Fields, and the Nazis disastrous rendezvous with destiny at Stalingrad . Or…maybe the OKH will decided to strike north again at the Soviet Capital? Operation Zitadelle, 1943: Hitler’s last chance at getting a “victory” of sorts in the East after last winter disaster in the south. It’s a do-or-die proposition for the Germans, as the Red Army can finally fight on equal terms. Will Kursk be the tombstone of the Panzers? Operation Bagration, 1944: The Soviet summer offensive that finally broke the back of the Wehrmacht, and made the Normandy landings look like a mere scuffle. Will you finally expel the hated foe enemies from their last foothold in Mother Russia? Absolute War Campaign game: From Operation Barbarossa in 1941 to the aftermath of Bagration in 1944. The whole conflict up to the gates of Germany is played out in dramatic fashion. Playing time: Approximately 3 - 4 hours for a full campaign game, 1- 2 hours for the Shorter Scenarios. Scale: Each unit is one Army/Front: Each area is about 200 kilometers from side to side. Each turn represents two months of real time.